The new edition features 16 additional Riders I found (or who found me) after the first edition came out in 2008. I was especially happy to add Jesse Davis, from Jackson, Mississippi. A number of the Riders arrested in Jackson were locals — from somewhere in the state — but as a group they proved more elusive when I first went looking for them, in the mid-2000s. I missed Davis even though he was hiding in plain site just 60 miles north of me, in Dutchess County, NY. I finally caught up with him for a new portrait and interview in 2016. On the evening of July 9, 1961, Jesse Davis attended a mass meeting about the Freedom Rides in a Jackson, Mississippi, church. It was the moment he had been waiting for. Davis, who had just graduated from Lanier High School, knew that change in Mississippi was going to require something more substantial than individual action, no matter how brave. In church that night, he found that “something like that” had finally come to Jackson. Shortly after the Freedom Rides came to Jackson, I went down to Blair Methodist Church for a mass meeting. I heard, I think, James Bevel and Bernard LaFayette speak. I said, Woah! [Laughs.] I had heard that from Barnett before, but to hear an outsider repeat it. It was a call to duty. So I got in the car with Fred, Joe Watts and some of the others, and we drove to the Trailways station and got arrested. When I first walked into that church, I felt somewhat liberated. But when they put me in the paddy wagon, I felt like the chains had fallen off. I was thinking about verses in the Bible about the chains falling off, and I was feeling free. Like many of the riders from Jackson, Davis went from his arrest at the Trailways station to Parchman and then back to the frontline. He worked in the Jackson Nonviolent Movement as a field secretary for SNCC and participated in a number of campaigns, including the Freedom Vote, a state-wide mock election held in the fall of 1963 to demonstrate that black Mississippians wanted to vote. In the 1964 he spent two weeks training Freedom Summer volunteers in Oxford, Ohio, before they came to Mississippi, then spent the remainder of the year working in Greenville, Mississippi, on voter registration. In 1968 Davis moved to Milwaukee to attend law school at Marquette, but instead got involved as an organizer in Father James Groppi’s fair-housing campaign. Two years later he moved to New York and began a career in social work. Until he retired in 2005, he was employed by various public agencies in New York and Connecticut, working with people across a range of needs, including neglected and abused children, the mentally retarded and developmentally disabled, homeless families, and others. Even in retirement, he continued to work part-time as a social worker. He died in 2017. I’m thrilled to announce that Vanderbilt University Press has published an expanded edition of Breach of Peace in paperback. They’ve let me add new portraits and profiles of sixteen Riders I found — or who found me — after the original edition was published in 2008. I’ve also updated the profiles of the original eighty-two featured Riders. We’ll have printed copies in hand . . . real soon. Ish. For sure. now! 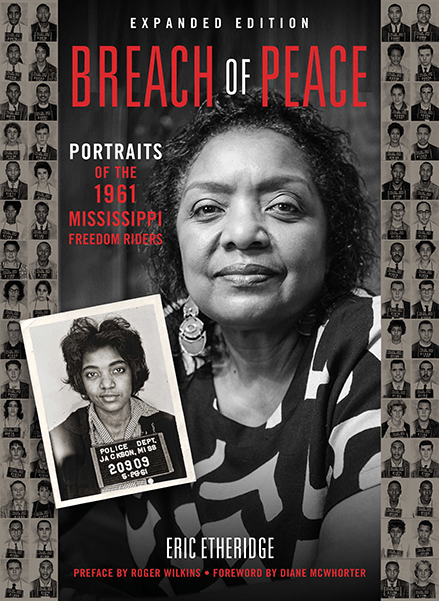 In the meantime, the book’s already generating press: “50 Years After Their Mug Shots, Portraits of Mississippi’s Freedom Riders,” on the Lens Blog at the New York Times. 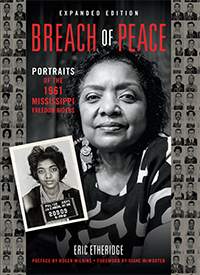 On the new cover is Catherine Burks-Brooks, a Rider born in Alabama, a student at Tennessee State in 1961 and a member of the Nashville Student Movement. Burks-Brooks was part of the group that quickly went to Birmingham to keep the Rides going after the violent attacks in Anniston and Birmingham.